Ideal time to ring you? * Now 02:30pm - 03:30pm 03:30pm - 04:30pm 04:30pm - 05:30pm 05:30pm - 06:30pm Tomorrow Morning Tomorrow Evening When would you like us to call? As dedicated providers of exam desks and other education furniture we make sure we offer top quality products, affordable prices and next day delivery of your items across mainland Britain. These top benefits of our specialised service attract many UK schools, colleges and universities that want high quality exam desks and chairs for their assessments. Our focus on education furniture means we’re very experienced in this industry. We supply a diverse range of chairs, and lightweight folding exam tables. Large warehouses ensure we can offer very large batches of products for hire. Delivery teams travel from London or Manchester to cover the entire UK. We print all our purchase and hire rates and offer deals on big orders. We decided to set up our service to meet the needs of schools, colleges, universities and any other type of organisation that are arranging assessments. Because we are fully concentrated on this aspect of the hire furniture industry we put all our efforts into giving a great experiencing of renting all those necessary items for exams. We know that it’s important to offer great quality, durable products that are perfectly designed for long periods of sitting down. As well as this we keep your costs as low as possible by stocking cost effective hire furniture and competitive delivery rates, so as well as hiring affordably you can have them transported to your desired destination at a cost effective price too. If only getting your exam furniture was as simple as making one phone call - well when you hire items from us this is exactly how straightforward the process is. We also make choosing the products as easy as possible too by providing detailed information about our education furniture. 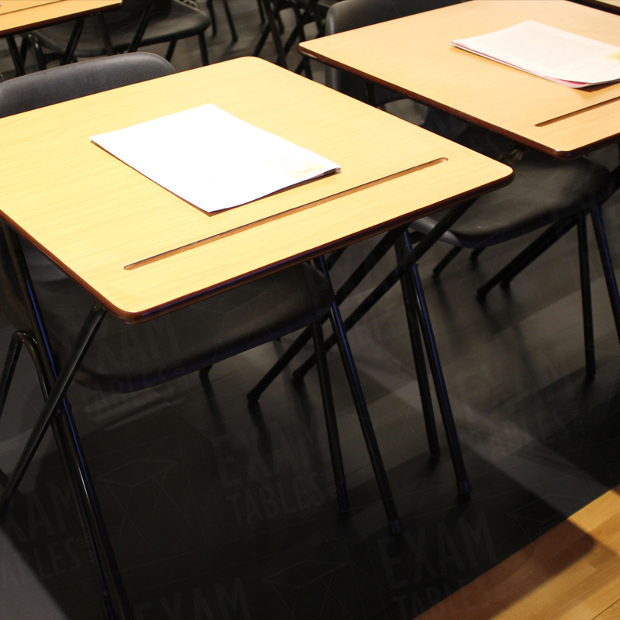 Our folding exam desks are one of the top items hired and purchased by our customers because it is so affordable and made from durable 15mm wood. The laminated, slanted surface means it stain resistant and comfortable to work on, while the folding mechanism allows it to be set up in just a few seconds. 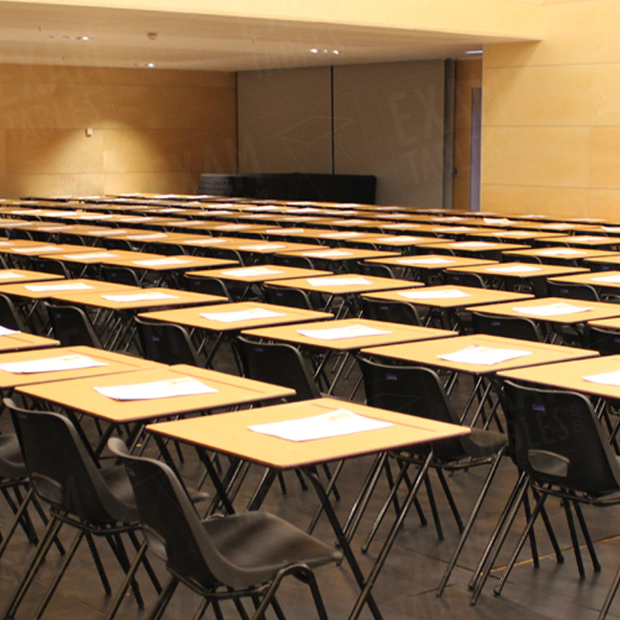 Our diverse range of exam chairs, includes our affordable polyprop seats, as well as our upholstered stacker chairs. For extra versatility, then our lecture chairs feature a comfy seat and a black writing table that rests in front of the seat providing a handy writing surface. For ultimate convenience, then try our folding chair in white. This product is not only very light, but it can be folded and set up in seconds. The elegant design is perfect for occasions where you’d like to add some extra sophistication to your functions. Need thousands and thousands of chairs and tables? Large orders are our speciality and we are very experienced in loading up our lorries and transporting huge batches of exam desks and chairs across the country. Part of the reason we can offer a service like this, is down to our huge warehouses. Located in both Manchester and London, our depots mean we can cover the whole of mainland Britain in our next day delivery network, for both large and small orders. Another reason we can meet large orders is because of our dedicated warehouse and delivery team. As well as working around-the-clock to load lorries and hit the roads, they are also on hand to help installation of your items. Quite often the top priority when it comes to arranging events is your budget. Keeping costs down and opting for the most affordable furniture hire option is a reality when you choose to hire education products from us. This is because we reveal the prices for all our products so you can see exactly how much your order costs from the very beginning. You can also see the deals we run for large orders, as we show how the price of each item decreases the more you hire. Yet another way to get the best education furniture deal is to take advantage of our lowest price guarantee. Just send us on any quotes and we will do what we can to match them, so you can benefit from the cheapest quote around! So when it comes to exam time or your business is holding assessments and needs extra education furniture, just give us a call and we can even get you the affordable products you need by tomorrow. 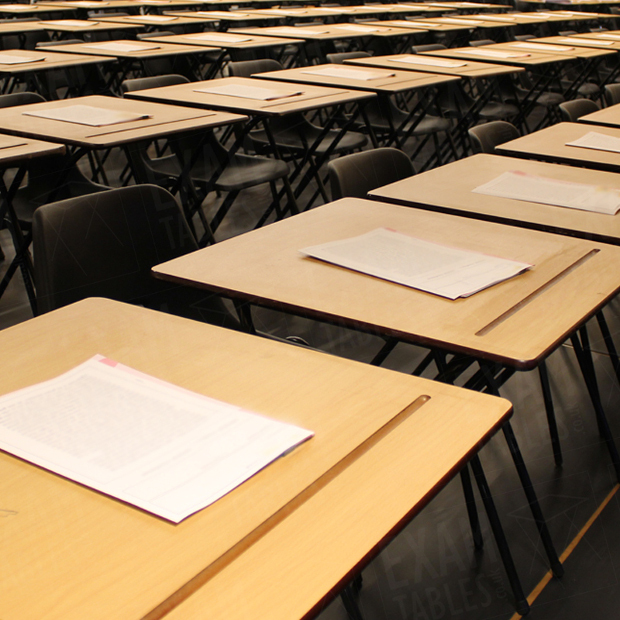 Why hire exam tables from us?